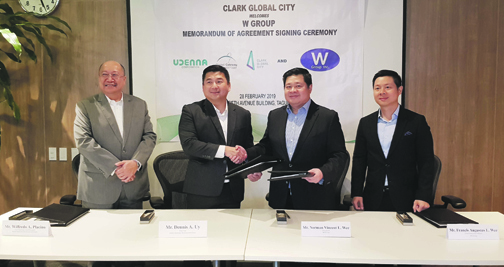 Global Gateway Development Corp. and W Group Inc. sign a memorandum of agreement to sublease 21,918 square meters in Clark Global City. Leading the signing ceremony are (from left) GGDC vice chairman and president Wilfredo Placino, GGDC chairman Dennis Uy, W Group president Norman Vincent Wee and W Group chief executive Francis Augustus Wee. W Group, through its designated subsidiary, affiliate and partners, will construct a mixed-use development, with a time-bound option to sublease an additional 14,065-square meter lot.